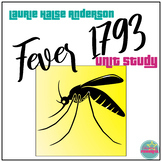 Excerpt of Chapter One from Fever-1793 by Laurie Halse Anderson. 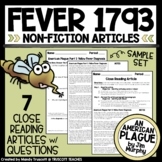 3 column format- text, question, room for student answer. Higher-order questioning. 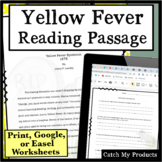 An illustrated one-page article about Yellow Fever which was a disease that caused many deaths during the summer season in Old Florida. Cause, cure, and old theories are presented. 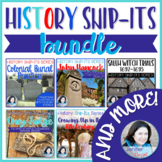 Included is a short reading check with questions. 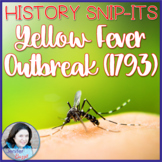 Yellow Fever Virus Power Point reviews history, facts, symptoms, outbreaks, vaccine etc. 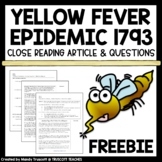 This PowerPoint is for CCSS 5.26: Yellow Fever in the 1870s - focusing on the outbreak in West TN.